Virtual tours are the best way to show off an environment to customers, visitors, staff and anyone who wants to take a virtual peek. We’ve been offering professional 360° tours using photography, web and graphic design since 2006, creating bespoke tours for businesses, schools, restaurants, venues and charities that help to explain, reassure or promote. Using the latest technology, we capture your subject, and convert it to a tour that lets viewers zoom in and out, click on information buttons, scroll round the tour in their own time and use hot-spot links to navigate to new rooms or areas. Our experience as photographers and graphic designers means we understand how to capture and present images, and our tours take this promotion to the next level. A 360° tour is proven to keep visitors on your site and encourage them to enquire or buy – so why not see what we can do for you? 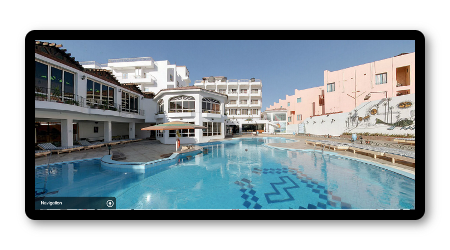 An example of a 3 panorama virtual tour including stills photography and a new navigation menu. View our tour of The Enterprise Centre in Farnham, Surrey. An example of a 5 panorama virtual tour for a local commercial property agency. 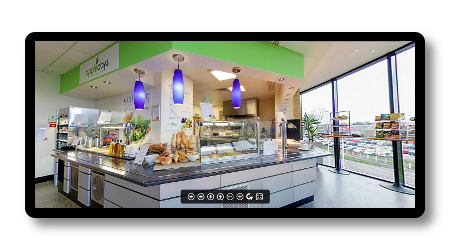 An example of a single panorama virtual tour showcasing Blue Apple catering services in Hemel Hempstead. What is a 360° virtual tour? Our virtual tours comprise of a series of professionally taken high resolution photos of your business location or services. These images are seamlessly “stitched” together by our virtual tour design team creating a truly unique, interactive web experience giving your website visitors a 360° panoramic view of your business, venue, property or services. Other media like sound, video and text can be used to enhance your website visitors experience. Why have a 360° virtual tour? Firstly, and most importantly they are a proven marketing method used typically by hotels, restaurants and the housing market as they have the unique ability of putting people ‘within’ the place or space you want to promote. This engages your website customer and allows them to connect visually and interact with your business site or venue. Secondly they look stunning, immediately capturing your website viewers’ attention and imagination. WOW your potential customers. 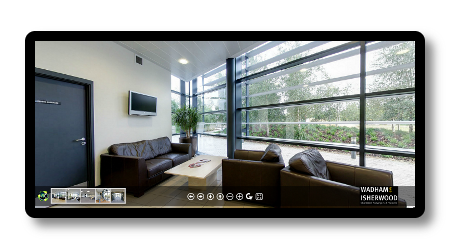 All of our virtual tours are bespoke, carefully crafted to your company branding. They can include exciting eye catching and useful tools like interactive floor plans, sliding information panels, hotspot navigation buttons, Google maps and with professional still photography you will stand head and shoulders above your competitors. We believe there is no better visual, interactive marketing tool to promote your location or services.